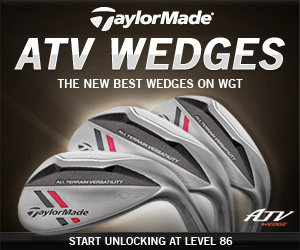 The latest ATV (All-Terrain Versatility) technology from TaylorMade is now available in new virtual wedges designed for high-level players on World Golf Tour. These new wedges provide solid overall performance along with a highly-requested slower WGT swing meter to help hit more perfect shots. Rent or buy these clubs and post your reviews in the WGT Pro Shop. The top-performing virtual NIKE golf balls on World Golf Tour have been upgraded. Now with added vapor trails, trace your shots more easily through the air with these new NIKE Vapor Balls, just added to the WGT Pro Shop. These upgraded virtual golf balls offer more distance, spin and control, as well as a slower swing meter, to help improve your shots. NIKE 20XI-S: Provides more spin and control, good for approach shots and Closest-To-The Hole tournaments. Standard Balls unlock at L47 and L70. New Vapor Balls unlock at L56 and L74. NIKE 20XI-X: Provides more distance and control, good for longer shots from the back tees. Standard Balls unlock at L48 and L71. New Vapor Balls unlock at L57 and L75. 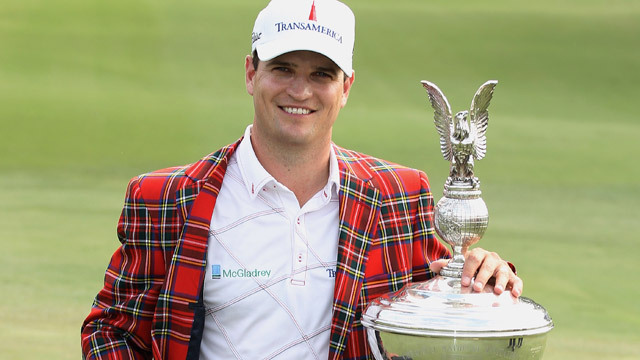 Zach Johnson derailed the Jason Dufner history express Sunday, denying him his third victory in four starts with a surprisingly nervous one-shot victory at the Crowne Plaza Invitational at Colonial. Johnson posted a final-round 72 to complete a 12-under-par 268 total, earning his second win at the event in three years. He took a three-shot lead to the 18th hole and appeared to have won by three, but he moved his ball mark on the final hole and failed to replace it before putting out, a two-shot penalty for violating Rule 20-7, which turned his final-hole par into a double-bogey. Dufner shot a final-round 74 for 269 while Tommy Gainey was solo third (67-273) and Jim Furyk fourth at 68-274. Johnson's final four-foot putt turned out to be for the win, which he dedicated to his longtime caddie Damon Green, whose father passed away 10 days ago. After the tournament, Johnson took the blame for failing to replace his mark. He also hit out of turn on the 18th tee, which did not incur a penalty. "That's on me," Johnson said. "Damon was raking the bunker and never saw me move the coin and I never moved it back. There were a lot adjectives going through my head, lucky, fortunate, stupid, but it's a good thing I hit a solid putt." 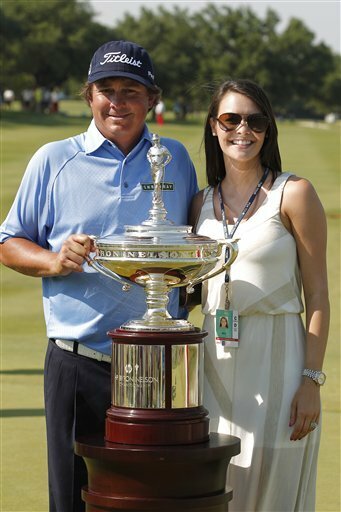 "It was certainly one of the weirdest finishes on the PGA Tour, but he played better than me," Dufner said. "He deserved the win. It wasn't bad luck on my part, it was bad play." The two-man duel turned on two watery mistakes by Dufner, both when he either had the lead or was tied. After a short birdie miss on the par-3 eighth hole, which would have extended his lead on Johnson to three shots, Dufner put his tee ball in the rough on the par-4 ninth. But from 107 yards, his wedge approach came up short, bounced on the bank, and rolled back in the water. A mediocre chip and two putts left him with a double-bogey and a tie with Johnson at 14 under. After trading birdies and bogeys, the pair was tied again coming to the par-4 15th hole. Dufner made his second watery flaw, the one that cost him the tournament. He put his tee shot in the bunker on the left side of the fairway and then, with 142 yards to the green, overshot his target. The approach hit the slope and rolled into the water behind the putting surface. He chipped his fourth shot off the green, put his fifth next to the pin and missed from five feet for a triple-bogey 7. "It's tough," Dufner said, "a lot harder than finishing 40th every week. I have a new appreciation for it." Full results from the Crowne Plaza Invitational at Colonial Country Club. Read more about your favorite professional golfer at Global Golf Post, or come try your own skills in a full golf tournament at WGT. There's a new best driver on WGT. 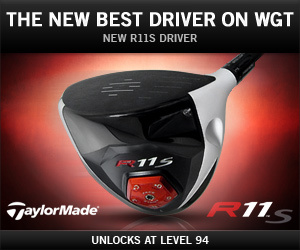 We've just added the TaylorMade R11S virtual driver to the WGT Pro Shop. The R11S offers more distance, precision and forgiveness than the original R11, and unlocks at Level 90. This is an ideal choice for top WGT players looking for the best driver in the game to add to their virtual golf equipment collection. Top players will want to pair the R11S with the NIKE 20XI-X balls, which together can drive the ball over 300 yards on a flat fairway with no wind. This weekend, play in the free Memorial Day Tournament with expanded credit prizes AND get a free Stars and Stripes Avatar when you purchase $10 or more WGT Credits. Offer only available Thursday, 5/24 thru Monday, 5/28. Join the Memorial Weekend Tournament that honors American war veterans. It's a free closest-to-the-hole virtual golf tournament played on Congressional Country Club golf course. This special tournament also has an expanded purse of 50,000 WGT Credits up for grabs. 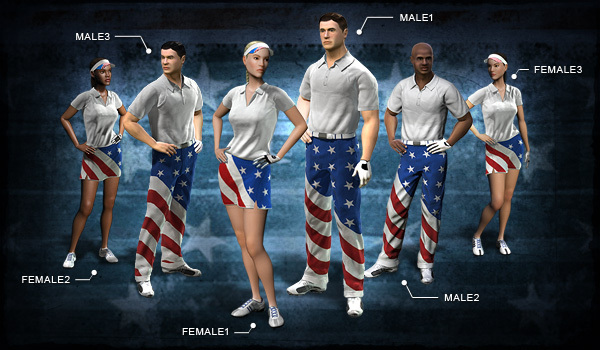 Also this weekend only, get a free Stars & Stripes Avatar when you deposit $10 or more WGT Credits. These avatars are valued at $8, but are yours free when you buy $10 in WGT Credits and enter the promo code for your favorite. Or, you can collect all six by making six separate purchases. To choose from the 6 different male/female avatars, just enter the corresponding promo code (MALE1, MALE2, MALE3, FEMALE1, FEMALE2, FEMALE3) when you buy your WGT credits. Jason Dufner is a happy man these days after getting his second PGA Tour win this weekend at the HP Byron Nelson Championship at TPC Four Seasons. This comes within a month of his first victory on April 29 at the Zurich Classic in New Orleans, and getting married the following week. Dufner finished the golf tournament Sunday with a one-stroke victory over Dicky Pride with a 25-foot birdie putt on the final hole. That closing birdie wrapped up a 3-under 67 round for an 11-under 269. Pride finished 3-under 67 for a 10-under 270 on the tournament. Phil Mickelson finished tied for seventh place with 6-under 66 and last weekend's Players Championship winner, Matt Kuchar, ended up tied for 15th with 4-under 70. Both remain steady in the FedEx Cup Rankings: in fourth and sixth places, respectively. This win makes Dufner the second two-time winner this season, along with Hunter Mahan, and also knocks Mahan out of the #1 spot in the FedEx Cup rankings (now #2) -- replaced by Dufner, who was #12 last week. 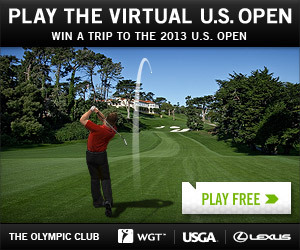 Join the main event of the 2012 Virtual U.S. Open on WGT for your chance to win a Grand Prize trip to the 2013 U.S. Open. 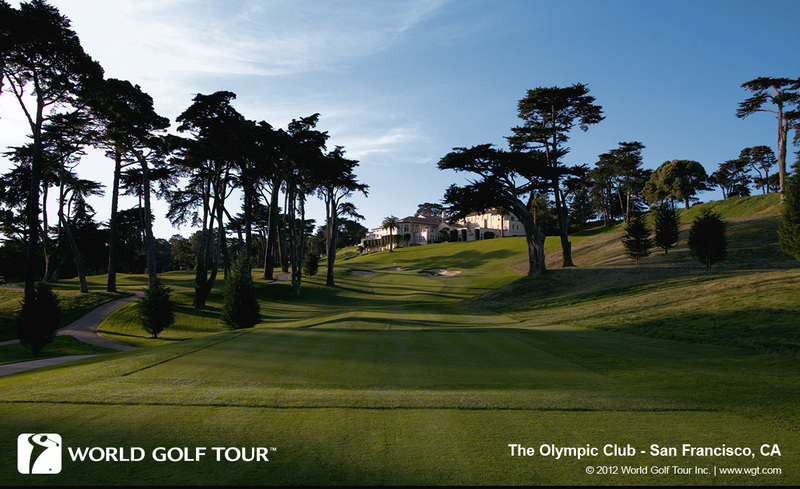 The golf tournament qualifier features 18 holes of full strokeplay golf on The Olympic Club golf course, the host of the 2012 U.S. Open. One lucky sweepstakes player, regardless of their score, will win the Grand Prize trip to the 2013 U.S. Open. In addition, the top 156 scores in the Qualifier round will advance to the Virtual U.S. Open Championship tournament, and will compete for a second Grand Prize trip. After an exciting day of golf Sunday at TPC Sawgrass for the final day of the 2012 Players Championship, Matt Kuchar finished at the top with a 2-under 70, giving him his first win of 2012. Pars in the middle of his back nine holes turned out to be the key to his leaderboard top spot with a 13-under 275 total. Kuchar beat out Martin Laird (67), first-time winner Rickie Fowler (70), Zach Johnson (68) and Ben Curtis (68), all tied for second, while Na dropped to tie for seventh at 280 with a 76 after leading Kuchar by one shot going into the final day. Na struggled to focus while spectators continued to heckle him and the importance of golf's mental game became very clear. The win at TPC pushed Kuchar from #28 to #6 in the FedEx Cup standings. Phil Mickelson, who finished tied for 25th this weekend, remains in the #4 spot, while Hunter Mahan, Bubba Watson and Rory McIlroy sit at the top. 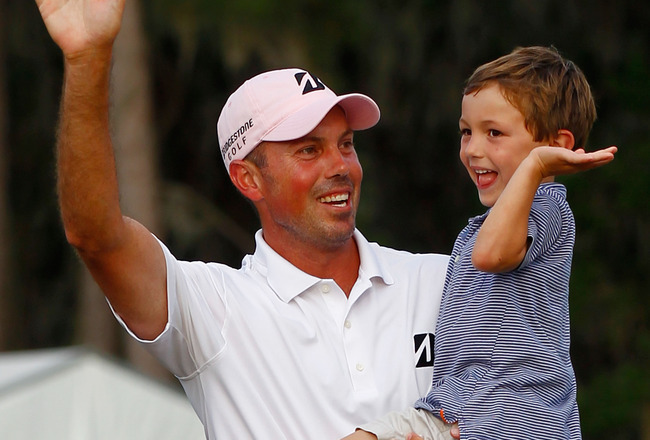 Kuchar celebrated his fourth career win on the 18th green with his wife, two sons and parents, and is now ranked #5 in the official world golf ranking. 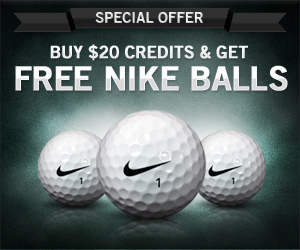 Get 3 free NIKE virtual golf balls when you purchase $20 or more WGT Credits. With this special offer, receive 3 free NIKE 20XI-X virtual golf balls to add to your golf equipment bag -- valid through Sunday, May 13 (also Mother's Day). NIKE's 20XI-X Balls feature a revolutionary RZN core that delivers more distance, as well as spin and control, and a slower swing meter. Pick up your free virtual golf balls now and use them to compete in the 2012 Virtual U.S. Open, played on the The Olympic Club golf course -- now available on WGT! Play the Back 9 Challenge for a chance to win some great prizes, or just an individual hole on The Olympic Club course -- all free to play! As we continue our coverage leading up to this year's 2012 U.S. Open golf championship at The Olympic Club, we'll take a look at the challenges awaiting players on the front 9 of the Lake Course. Any of the golf holes can be played free without signup virtually at World Golf Tour. This year, the course will play at a par-70 and 7,170 yards, which is 373 yards longer than when The Olympic Club hosted the national championship in 1998. The front 9 will play at a par-34 and the back nine a par-36 because the par on holes 1 and 17 have been flipped. More than half of the holes have dog legs, including four where the ultra-narrow fairways will go in opposite directions. Additionally, the elevation constantly changes and the unleveled lies could prove particularly challenging. •	U.S. Open, Hole 3: Expected to be the hardest par-3 on the course, as it grades slightly downhill and is protected by four bunkers, offering no safety to the side of the hole. •	U.S. Open, Hole 4: The best par-4 on the course. This dogleg left starts a steady dose of holes where shot shaping the ball is critical in scoring well. 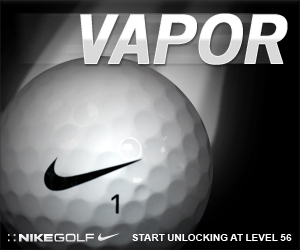 Play Hole 4 with top performing NIKE virtual golf balls. •	U.S. Open, Hole 5: Features a lot of elevation change where the fairway cants the opposite direction of the dogleg, which will pose quite a challenge for players. •	U.S. Open, Hole 8: Once one of the easiest holes on the course, it is entirely new from the last championship in 1998, and now features little room for error along the right-side trees. Try Hole 8 with a TaylorMade virtual driver on WGT. Stay tuned for weekly updates from WGT, and visit the USGA site for more information on the 2012 U.S. Open Championship.